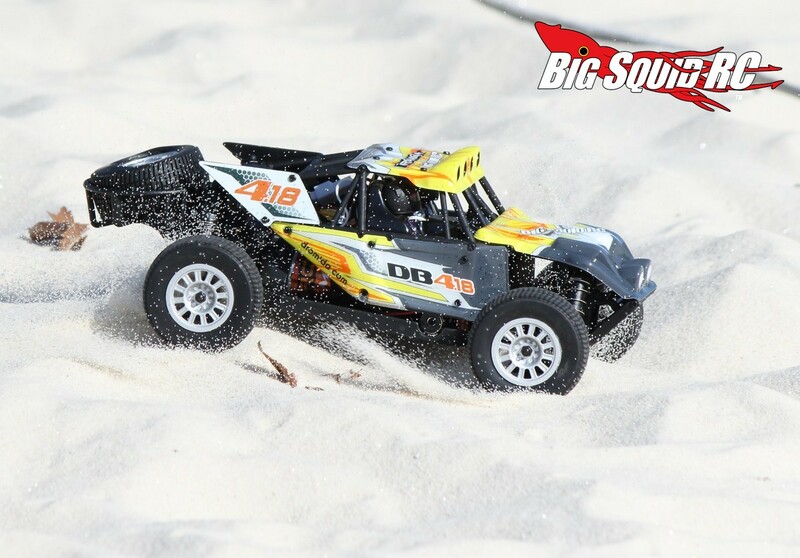 Dromida DB4.18 1/18th Desert Buggy Review « Big Squid RC – RC Car and Truck News, Reviews, Videos, and More! 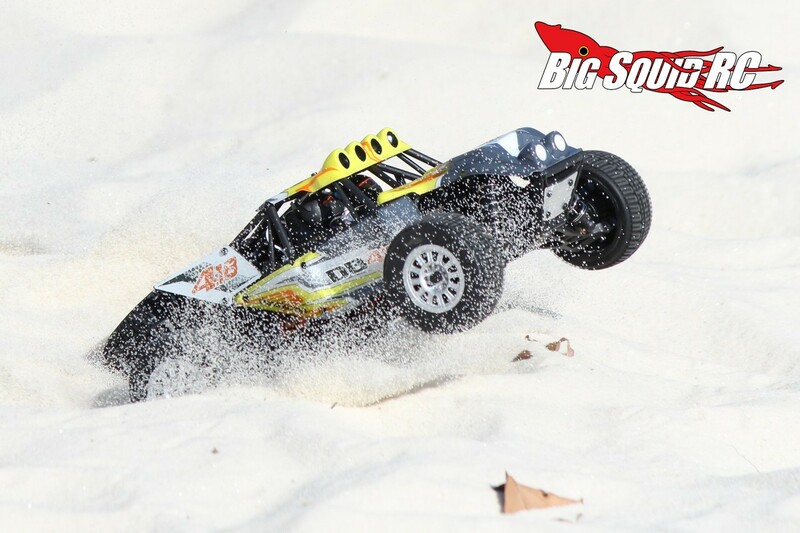 Primary Competition: Other 1/18th scalers from Helion and Associated. What’s Needed To Complete: Nothing, zero, nada. Build Quality: We didn’t find anything out of order when first inspecting the buggy. The pinion/spur mesh was fine, the shocks were properly filled, and we didn’t find any stripped screws. Test Drivers: Sam “Da’ Noobie”, Robbie G, Iron Mickie, T-$$$, and yours truly. 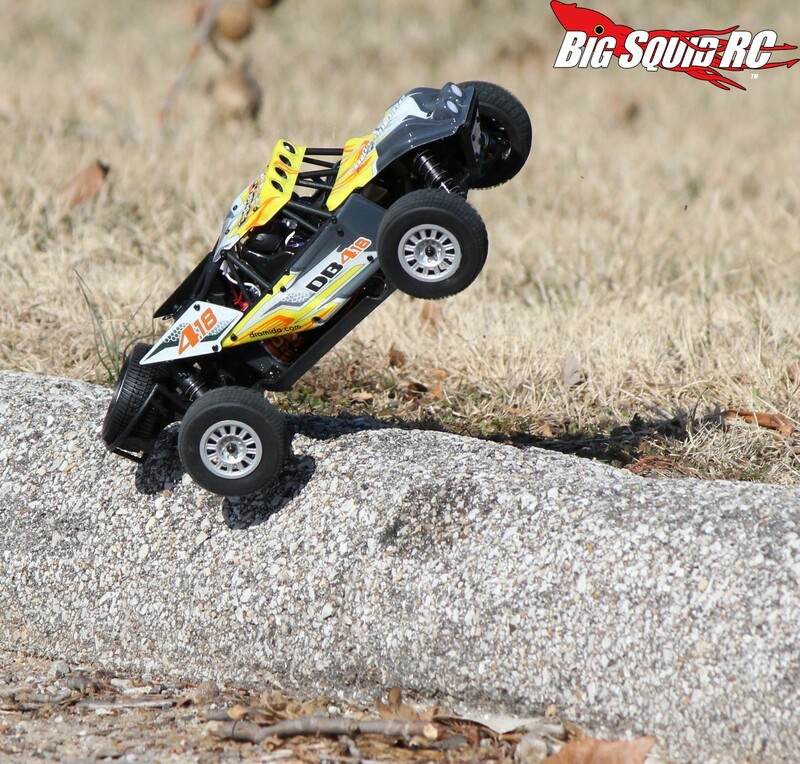 Test Venues: St Louis Dirtburners off-road track, Minnie Ha Ha park, e-Fest expo hall in Champaign Illinois, and our course our friendly local CostCo parking lot. Set-up Notes: We ran the DB4.18 all stock with two exceptions. 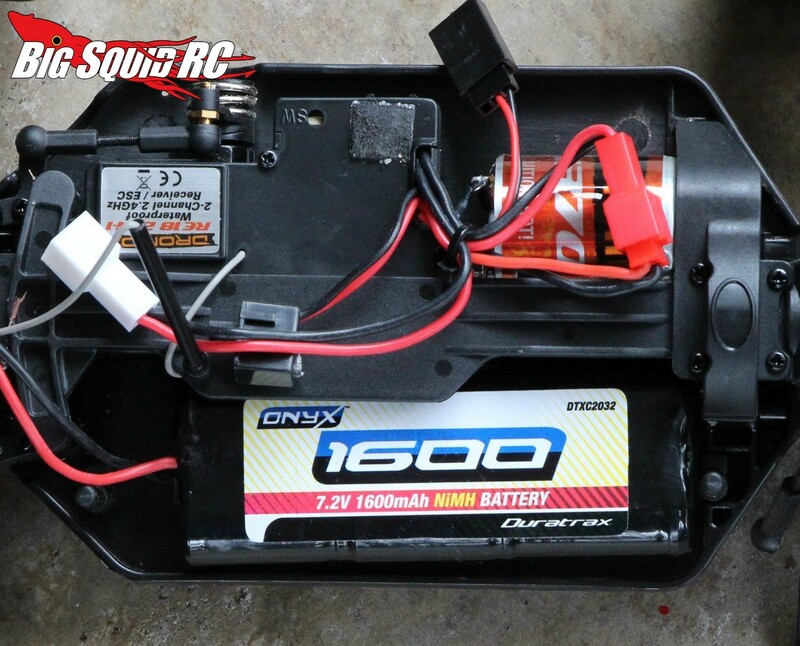 For a battery we used a Duratrax 7.2v 1600mAh NiMH and for charging we enlisted a TrakPower VR-1. Turning: The DB4.18 had some pretty hard oversteering at initial turn-in. For example, when doing speed passes you sometimes have to make slight corrections to maintain the heading and the buggy would steer too much with very little input. This wasn’t as noticeable on loose dirt, but on high traction surfaces it made the buggy hard to drive. 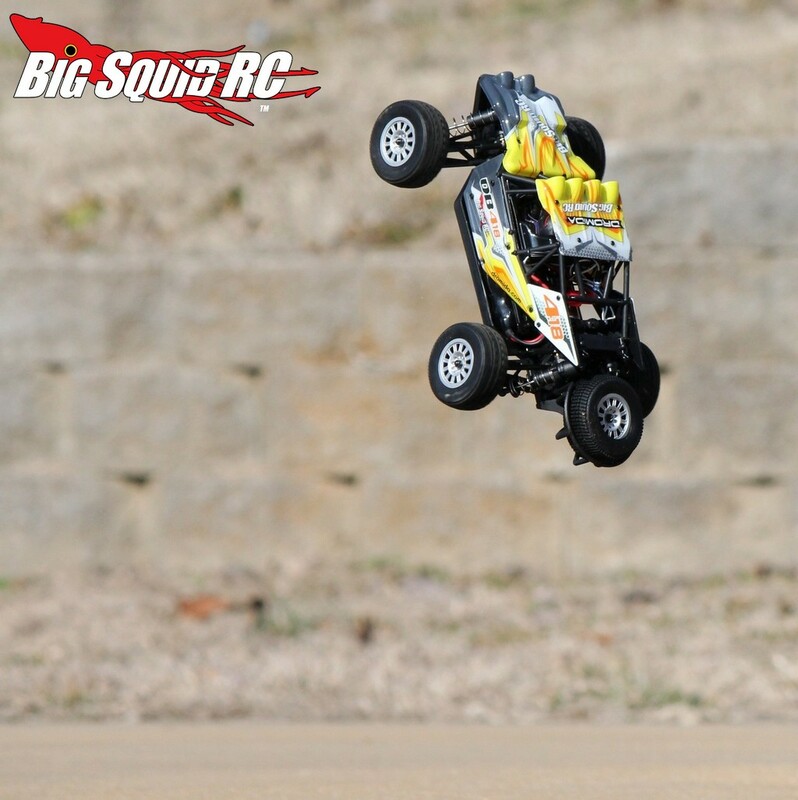 Once past the initial oversteer the buggy turned well. It had about the right amount of steering around the apex and had good on-power steering. 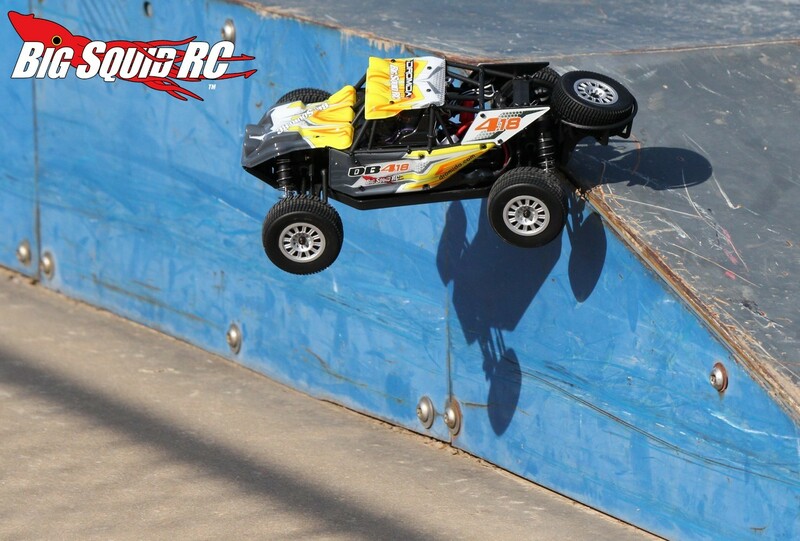 Jumping: Not bad for an 18th scaler. 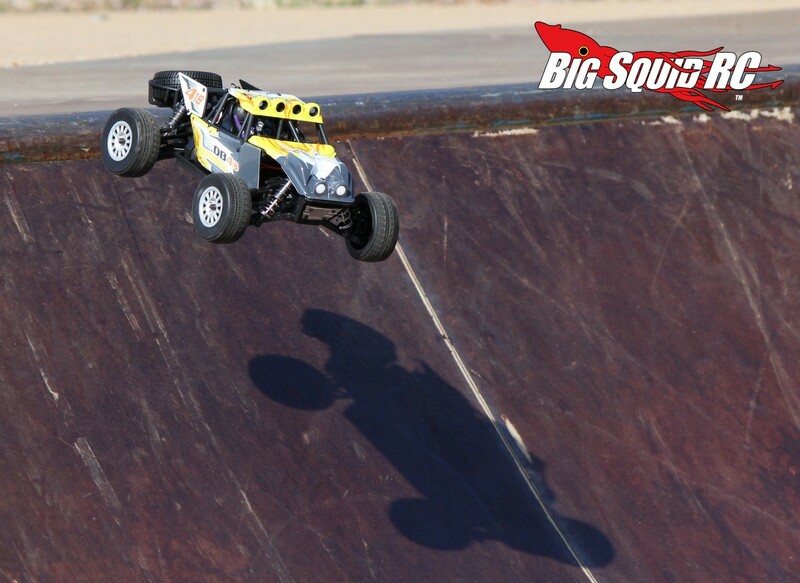 The buggy stayed nice and straight up jump faces and its suspension soaked up landings quite well. When looping out a light tap of the brakes easily brought the nose down, but the relatively low rpm stock power system did have enough yank to pull out of an endo. Bumps/Whoops: The DB4.18 had a bit more bounce in rough sections than we liked. 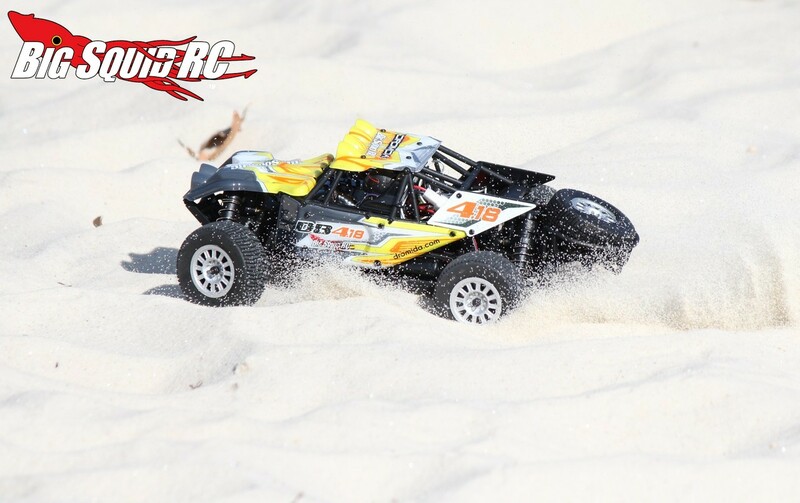 It comes with too much compression damping in the front, which is great for higher corner speeds on high bite surfaces, but makes it bounce over small potholes and dirt clods. Thankfully thinner shock oil is cheap and easy to install to make it more compliant in the rough. On-Road: The tuning of the suspension seemed best suited to driving on the street. It soaked up bigger bumps at speed quite well and generally was a blast to play with on pavement. 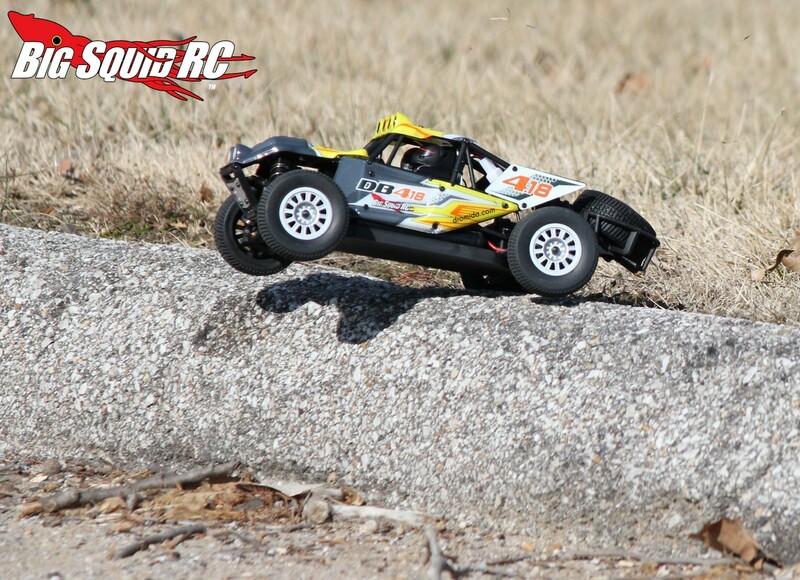 Grass: While the DB4.18 is far from the smallest rc we’ve ever tested, it is still on the small side for serious grass bashing. Yes, it can get around in short grass, but anything taller and it simply gets stuck. Tires: While not made from super soft race rubber, we found the stock tires did a solid job on a variety of surfaces. They were best for street use, but weren’t bad on packed dirt and light loam. We also noticed very little tire wear. Power: No, the DB4.18 is not fast. Its low end is quite soft, the mid-range is electric smooth but with very little yank, and the top end signs off at just 16 mph. Is this a terrible thing? No, it was perfect for noobs and we had fun with the stock power system. However, if you are an experienced hobbyist you’ll grow tired of the soft power system quickly and be looking for more yank. Radio: For a RTR radio the included unit was solid. It had good range, it never glitched, and its ergonomics were good enough for long term use. We liked the serrated trigger face and the foam covered wheel, things that most other RTR radios do not have. The wheel was also in a good spot in relation to the trigger and the grip. Broken Parts: We found the DB4.18 capable of taking some decent abuse. We chunked out a spur gear after a couple of full speed slams into a curb, but we had a hard time breaking any suspension parts. 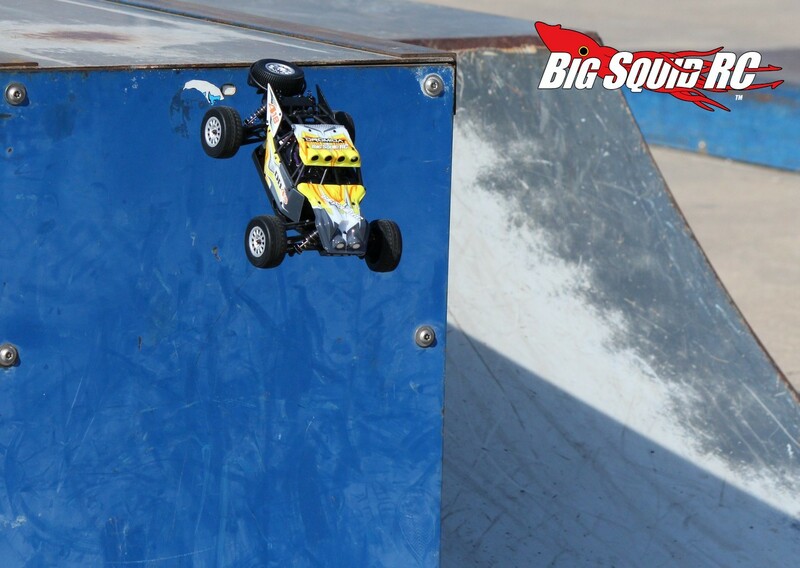 Finally we did a roof jump from about 10 feet high and landed at a weird angle on the drivers rear wheel. 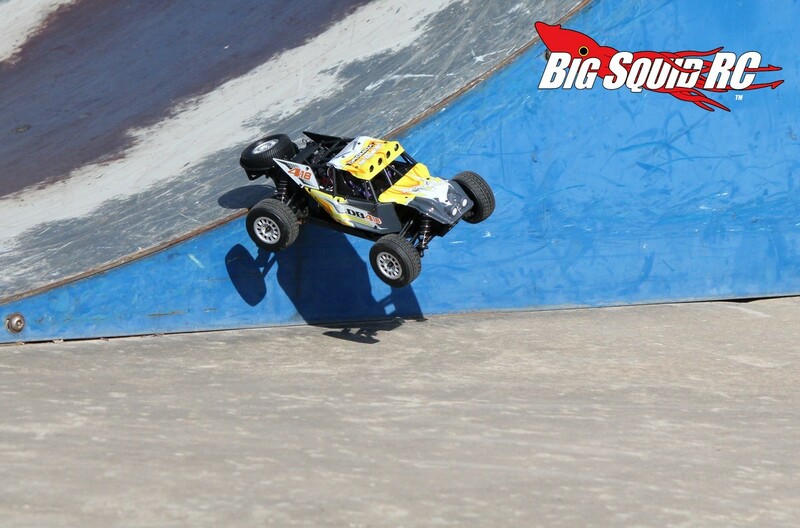 On that jump we broke a rear hub, broke two driveshafts, and ended up shoving the a-arm through the rear wheel. Overall? It didn’t break during “normal” type driving, we had to get abusive to bust some parts. While there is a lot of wiring inside the body of the DB4.18 (for the lights) it is smartly done and worked well for us (read- we didn’t have problems with the lights quitting). The spare tire, lights, roll cage, and other scale details are great touches. Big kudos to the Dromida crew on the scale detailing. 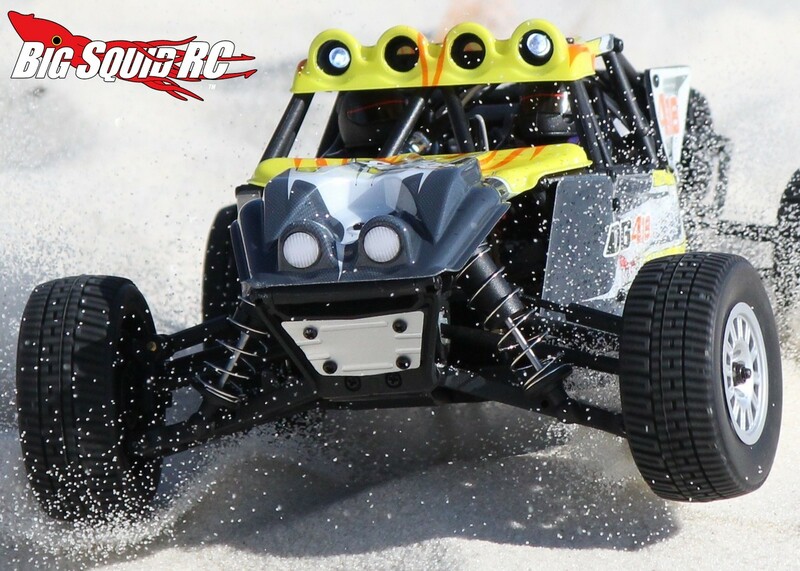 Even though the Dromida only tops out at 16 mph (indicating it is not geared too high), the motor likes to run hot. An overly hot motor means short life and less power. If you are up to the task, water dipping the stock motor will lead to longer life and more power. Here is a tale of two different drivers. Iron Mike absolutely loved the DB4.18. The soft power made it easy for him to drive and he liked how he could bounce it off curbs without worrying about breaking anything. Our in-house pro driver Tim Mohr has won loads of 18th scale titles and didn’t like how the DB4.18 handled out of the box. After testing Tim did some minor mods to the suspension, popped in a LiPo, and was instantly much happier with the way it drove. The steering on the Dromida did not like to stay properly centered. You could adjust steering trim, not hit anything, then 30 seconds later need to adjust it again. Best Cheap Mod: Swap out the shock oil. We’ve used Associated 30 weight in the past with good success in various Dromida vehicles. Also, a free mod that really helps is to add pre-load spacers to the front springs. This helps take out some of that nasty initial turn-in. Time To Bash: B Everything comes in the box and it is quick and easy to get bashing with the Dromida. Workability: B Remove two clips and the body rotates forward for easy maintenance. Car Show Rating: A Highly detailed body, nice graphics, scale appropriate wheels/tires, and the stock light kit make it the best looking 18th scaler we’ve tested. Bash-A-Bility: B Normal use didn’t end with any broken parts but we did break a few when going huge. Fun Factor: C The soft power system and twitchy initial steering hold down its score here. Handling: B When compared to other vehicles in its class the overall handling of the Dromida is above average. 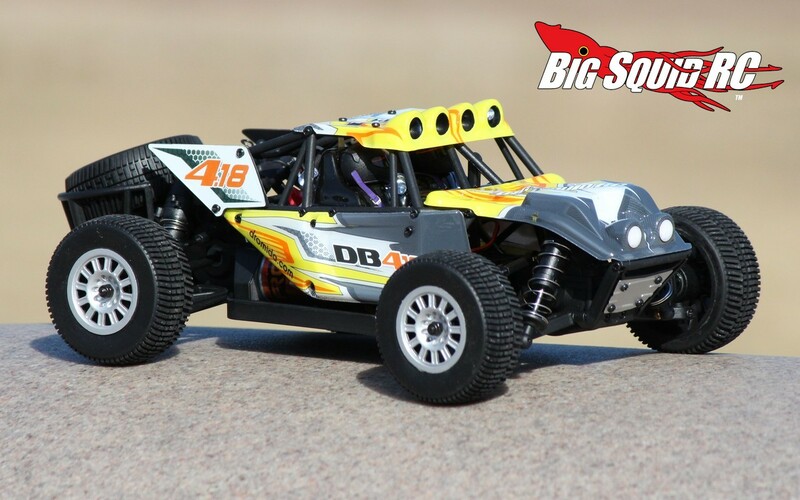 Value: B The DB4.18 is a solid buggy at a very affordable price point. Parts Availability: C The DB4.18 shares many parts with its Dromida brothers. This is a good thing because some hobby shops already have parts on the shelf. 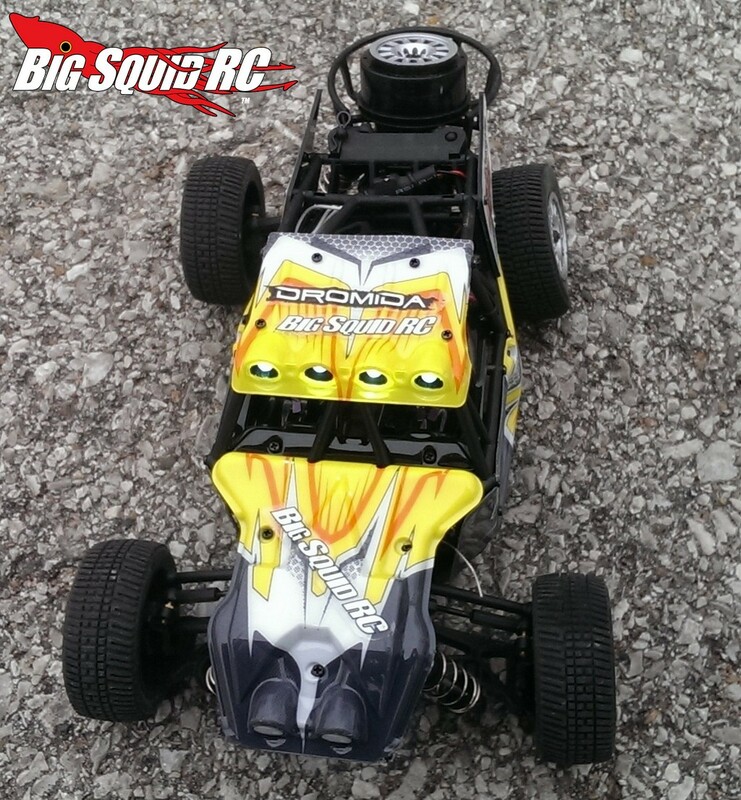 BigSquid Rating: B The DB4.18 comes with modern scale realistic details and is a solid bash machine. 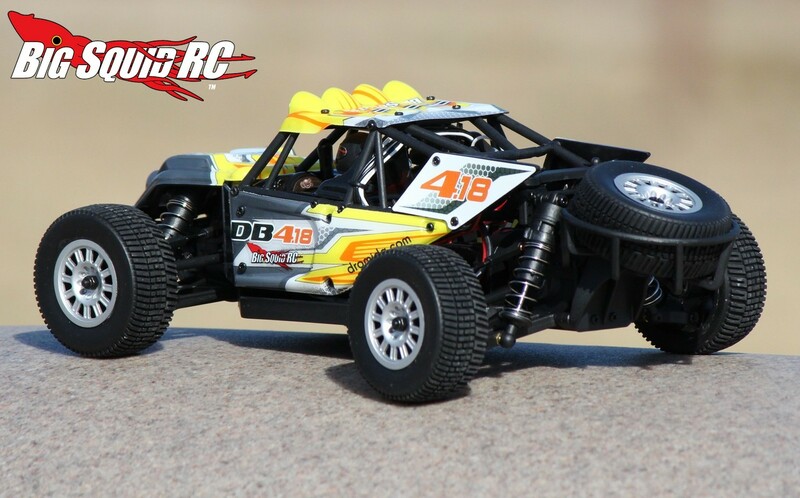 We can highly recommend the DB4.18 to anyone looking for a fun yet affordable basher.